Lauren Phillips is the collection manager at the New Canaan Library where she has worked for 30 years. 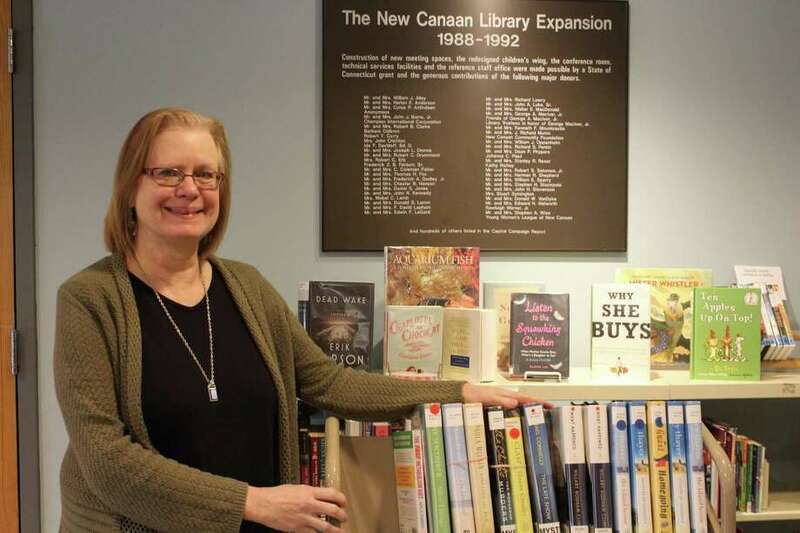 NEW CANAAN — From card catalogs to “clunky” computers and now to books in downloadable audio format, Lauren Phillips, 63, has experienced firsthand the evolution of the New Canaan Library. Phillips, the collections manager at the library, began as a part-time employee in 1987, two years after she moved into town. Her passion for books and trends in readership have kept her attentive to readers’ interests and feedback. Q: What does the collections manager do? A: The position involves selecting new things for the shelves and taking old things out. The collections depend on what books they have, what they are and what the demand is. A new book will stay on the new book shelf for about six months. If it’s been promoted enough, be it through reviews or word of mouth, then it’s constantly circulated. Some books will end up having 10 or 12 copies and stay on the new book shelf and be very popular for a few months, then we’ll start gradually moving them around. We have a second look collection, which are like the bestsellers you may have missed, and then eventually they’ll go to the regular shelves. Q: What changes have you seen in the library? A: Publishing has changed completely in the last 10 to 15 years. Now we don’t just have books and books on CDs, we get them in a lot of different formats. We have books in regular print and large print, books on CDs, on MP3 players and books on downloadable audio. For downloadable audio, so many people listen on their phones now and Bluetooth in the car that it’s our biggest growing category for circulation. It’s incredibly popular. Once people try it once, they want it. As for actual books, in the last few years there was a slight downward trend but now it’s flattened out and starting to go up again. Basically, people who really like an actual book want to have that again. E-books are fabulous for traveling but you know, the “death of the book” was exaggerated. People love books and there’s a huge demand for them. Q: When did you begin working at the library? A: I have worked at the library for 30 years and there have been many changes. All organizations have been completely changed by technology but libraries maybe more than most because it’s completely changed the way we build, circulate and manage collections. When I got here, we were phoning in orders and reading the book number to the wholesalers. Now everything is done online and with fast turnaround. We’re able to fill a demand for things much more quickly as we have better ways to communicate with people about what they want. So, yes, things have really changed. Q: Do you think these changes are for the better? A: Definitely for the better because we can get feedback from people really quickly. We have online forms so they can suggest things we can purchase and we have ways to track how many holds there are on each title and we know what we need in order to keep people happy. New Canaan is a very literate community, we have a lot of demand for high-quality fiction and good nonfiction and this isn’t true everywhere. We have a very educated community that has very high expectations of its library. Q: How did your interest in the library come about? A: I was a high school teacher — I taught Latin and Greek — before we moved here and it was my plan to go back into teaching. But since my children were toddlers, I took a part-time job at the library just because I’ve always loved libraries. And then I became fascinated with what you can do as a librarian, so then I went to library school at night and got a master’s. It’s been great. Q: What was your part-time job when you started out? A: This is a long time ago. Now when a book is checked out, you just scan the bar code. This was so long ago, in 1987, back when the library was first putting bar codes into the books. What it involved, the process of putting a bar code in the book, was looking up the book on a really clunky old computer and then importing the records from the clunky old computer into our very primitive software system and then finally putting in the bar code. This was around the time that we stopped having cards catalog — we had card catalogs! — we had a huge wall with them. The only way to find a book was by going through the card catalog and see what its call number was and then going to find it on the shelf. There were no computers, we had the office just for putting in bar codes. Retrospective conversion, that was my first job. I have been here through a lot of very exciting changes. Q: What would you say have been the hottest books so far this year? I go in every day and see what books are on hold and see what copies we need. Q: How many titles are in a collection? A: Book publishing is funny; new titles are always released on Tuesdays. So we always have a special shelf with new books coming for every Tuesday. We get things in everyday and take them upstairs. There are some days where we will take 50 to 60 books, some of them which may have holds on them — it depends on the ebb and flow of publishing. Q: And so, what can a librarian do? A: Librarians can do things for people they can’t really find in other places. Not only do librarians get things that entertain people, but they also are a huge help in evaluating information. Now there’s just such a flow of information — you can just Google a topic and get maybe way too much, some of it reliable, some not so much. Librarians can give guidance about what sources of information are reliable and help with all other things — applying for a job and doing taxes. People will come for help with resumes and job-seeking sites. We have online resources that can help people with that. Being a librarian is definitely an educational thing.